If you received a pandoro for Christmas, or see them marked down after Christmas, don’t let them sit: Turn them into dessert. 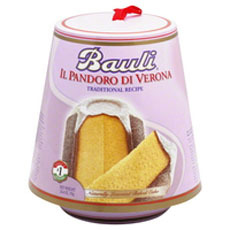 Pandoro is a lighter version of sponge cake, sometimes accented with lemon zest. You slice it and eat it, warmed briefly in the microwave. You can toast slices and top them with ice cream and chocolate or caramel sauce. Or, you can turn the cake into a sophisticated tiramisu. Tiramisu is traditionally made with ladyfingers or sponge cake. 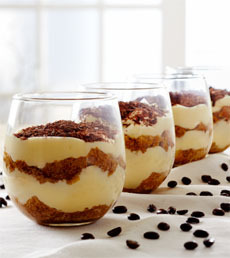 In this recipe, Chef Fabio Viviani turns it into Tiramisu for Bauli. *If you can’t buy mascarpone, use the recipe below for a substitute. †Marsala is a fortified wine, a category that also includes Madeira, Port and Sherry. It is produced in the region surrounding the Italian city of Marsala in Sicily, and has a D.O.C. (Denominazione di Origine Controllata) protected status. It is an ingredient in the desserts Tiramisu and Zabaglione, as well as Chicken Marsala and Veal Marsala. It is also enjoyed on the rocks. If you can’t get hold of it, you can substitute a sweet sherry. 1. BEAT the egg yolks with 2 ounces of sugar until creamy. Place the mascarpone in a large bowl and using a wooden spoon, press out any lumps. Then add the egg mixture and mix until well combined. 2. BEAT the egg whites, salt and the remaining sugar in a separate bowl, until fluffy and the egg whites hold their shape. Incorporate into the mascarpone mixture. 3. MIX together the Marsala and the espresso. Dip the pandoro fingers briefly in the mixture, making sure to not let them soak for too long. Lay them flat into a 7″ by 11″ Pyrex baking dish. Once the first layer has been laid out, spread the mascarpone mixture on top. Dust with half of the cocoa powder. Repeat the same process again with remaining pandoro, cream and cocoa. If you can’t get mascarpone locally, you can make an easy approximation of it with readily-available dairy products. Tiramisu means “pick me up,” a reference to the caffeine from the espresso liqueur and the energy from the eggs and sugar. While there are many variations of the recipe, tiramisu is typically composed of layers of sponge cake or ladyfingers, soaked in espresso liqueur, coffee syrup or marsala, and layered with a mascarpone cheese and custard mixture. It is dusted with cocoa or shaved chocolate. Mascarpone can also be served with biscotti. Photo courtesy Vermont Creamery. For what is a classic Italian dessert, tiramisu is a relatively recent creation. The origins of the dessert are highly contested, but a strong claim has been made that the recipe was invented in the 1960s at the restaurant Alle Beccherie in Treviso, Italy, by pastry chef Loly Linguanotto. The restaurant’s matriarch, Alba Campeol, got the idea for the dessert after the birth of one of her children. 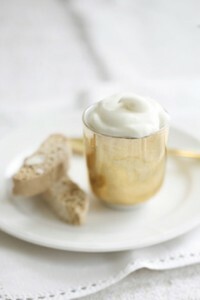 Weak in bed, she was brought a zabaglione spiked with coffee, to give her energy. When she returned to work, she and her pastry chef worked on the “pick me up” layered dessert. The original Becchiere recipe did not contain alcohol because it was served to children as well as adults. Today, a good tiramisu is redolent of espresso liqueur or Marsala. You can read the full story, plus competing claims to the invention by another Treviso restaurateur, Carminantonio Iannaccone, in this Washington Post article.